Nope, just some really cheap “generic” action figures that I’ve picked up here and there. M.A.S.K. figs. 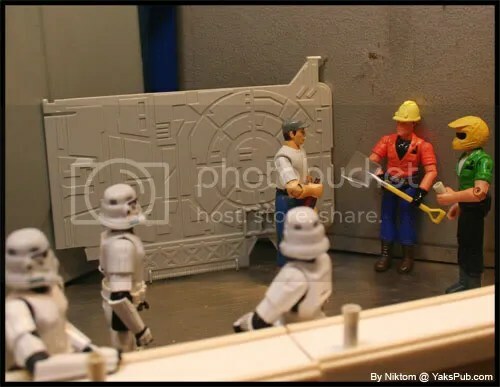 aren’t of the same scale as SW. Those were some sweet toys though. I had a few and kind of miss them. Thought about picking some up again a few years ago but backed out. If you think costuming is hard,try marching in 107-degree heat with a sousaphone on your shoulder for hours every day. Now that’s not disturbing,it’s just wrong. 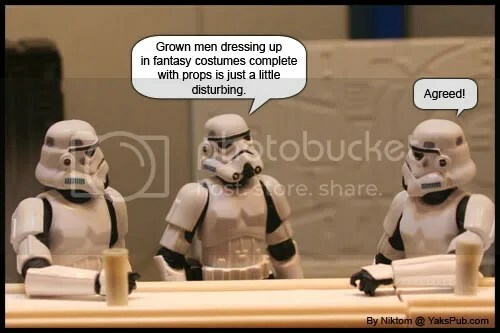 Looks like those three are gonna get more abuse from the Stormtroopers then Jar-Jar ever did. This cracks me up! 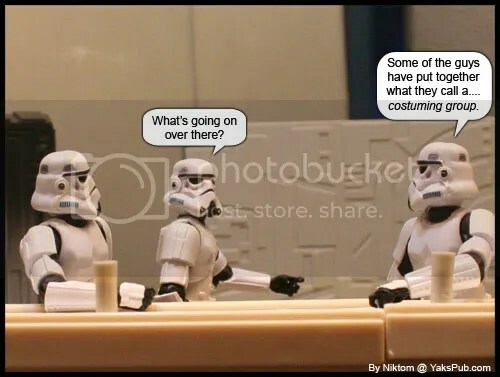 Need to make sure my stormtrooper sees this. I don’t know if he knows you’re posting again or not. Oh I know. I am caught up on your postings. I just haven’t commented. Agreed grown men dressing up?!? Ridiculous.